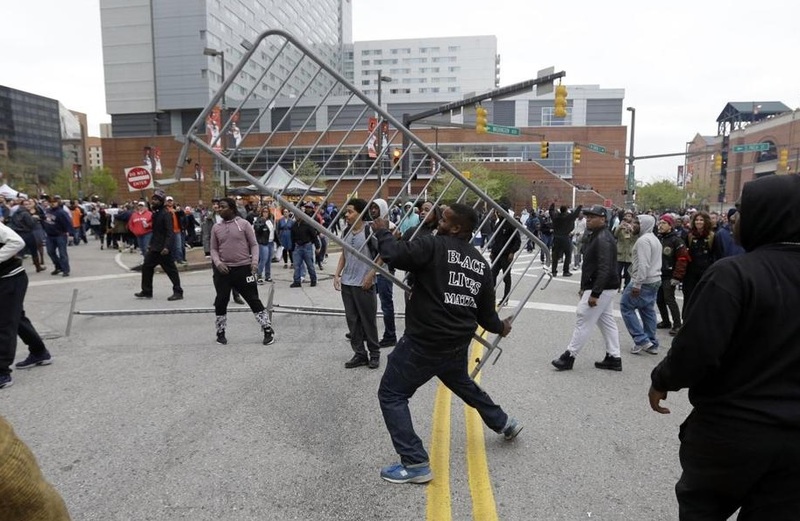 A Freddie Gray protester hurls a guard rail through a store window in Baltimore. Mayor Stephanie Rawlings Blake told reporters she gave protesters “the space to destroy” during the Baltimore riots. ** Baltimore hooligans torched 61 businesses, damaged 350 businesses, and injured 113 police officers during the riots. This month Rawlings-Blake was elected the first African-America woman to lead the US Conference of Mayors after her stellar work in Baltimore. Mayor Rawlings-Blake will discuss the Freddie Gray case in her inaugural address as president of the US Conference of Mayors. In her inaugural address as the new president of the U.S. Conference of Mayors, Stephanie Rawlings-Blake on Monday plans to discuss the Freddie Gray case and the subsequent unrest in Baltimore. Rawlings-Blake said she will call on mayors across the country to develop a bi-partisan agenda at a September meeting in Baltimore to address systemic issues, including poverty, that were highlighted by April’s unrest. She said the agenda will be called the “Baltimore Compact,” and the mayor’s group will press both Republican and Democratic presidential candidates to agree to it. Congratulations @MayorSRB on becoming President of the @usmayors! I look forward to continued collaboration on our shared priorities!